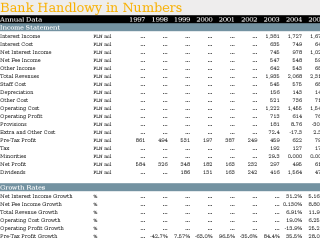 This Annual statistical dossier offers a summary of Bank Handlowy's performance between 1997 and 2017 on an annual basis. The report can be downloaded as an excel file. In addition, the excel file provides a detailed overview of the bank's market position in comparison with the overall banking sector. You can, for example, track BH's market position in mortgage or consumer lending. Bank Handlowy is a Poland-based commercial bank. It offers its products and services under Citibank Handlowy brand such as checking, or savings accounts, loans, insurance, and credit cards specifically targeted to individuals, small companies, and large companies. At the end of 2012, the bank operated 88 branches and 115 own ATMs across Poland with concentrations in Warsaw and Kraków. The bank was created by the 2001 merger of Bank Handlowy w Warszawie, Poland's oldest bank founded in 1870, and Citibank (Poland). The Bank's parent entity is Citibank Overseas Investment Corporation (COIC) holding 75% in the bank.. This report offers a summary of the company's performance in 2001-2012. You will find here all the key numbers from the bank's balance sheet, income statement and all the main ratios related to the bank's business. Bank Handlowy is a Poland-based commercial bank. It offers its products and services under Citibank Handlowy brand such as checking, or savings accounts, loans, insurance, and credit cards specifically targeted to individuals, small companies, and large companies. At the end of 2012, the bank operated 88 branches and 115 own ATMs across Poland with concentrations in Warsaw and Kraków. The bank was created by the 2001 merger of Bank Handlowy w Warszawie, Poland's oldest bank founded in 1870, and Citibank (Poland). The Bank's parent entity is Citibank Overseas Investment Corporation (COIC) holding 75% in the bank. 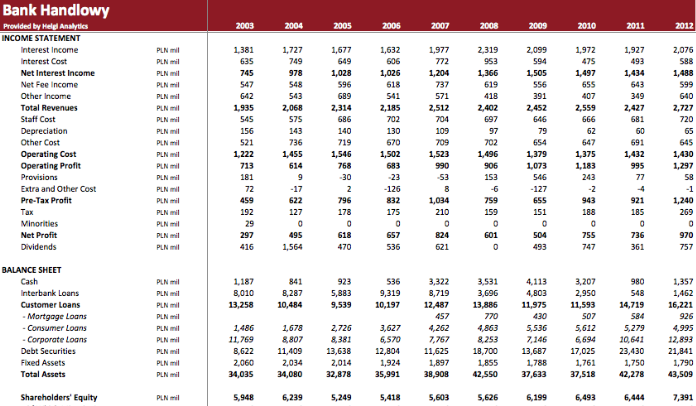 This excel file offers a summary of the company's performance on the annual basis in between 2003-2012. You will find here all the key numbers from the bank's balance sheet, income statement and main ratios related to the bank's business. Bank Handlowy's mortgage loans reached PLN 1,474 mil in 2017, up 12.0% compared to the previous year. Bank Handlowy accounted for 0.374% of all mortgage loans issued in Poland at the end of 2017. Historically, the bank’s market share in mortgage loans reached an all time high of 0.398% in 2008 and an all time low of 0.183% in 2011. 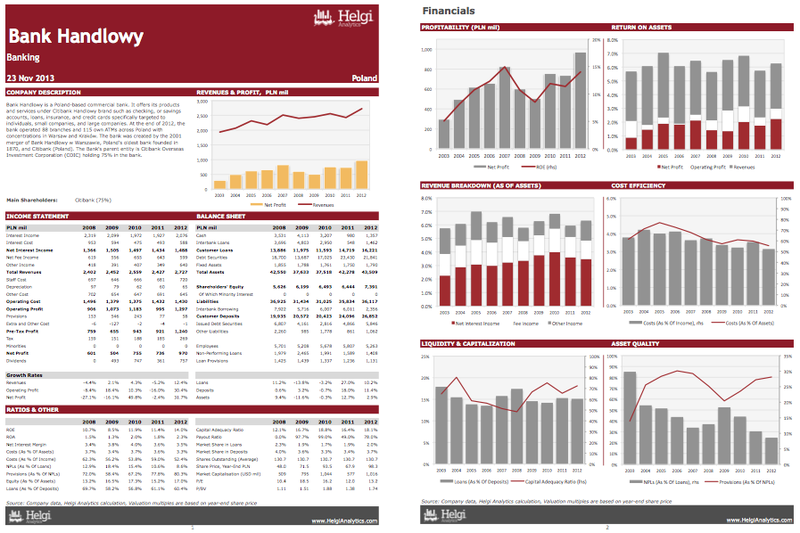 You can see all the company’s data at Bank Handlowy Profile, or you can download a report on the firm in the report section. What Banks in Poland Were the Most Profitable in 2016? Based on a comparison of 18 banks in Poland, PKO BP produced the highest net profit in 2016, followed by Pekao SA and Bank Zachodni WBK. PKO BP made a net profit of PLN 2,874 mil, up 10.1% compared to the previous year. PKO BP made a net profit of PLN 2,874 mil, up 10.1% compared to the previous year. 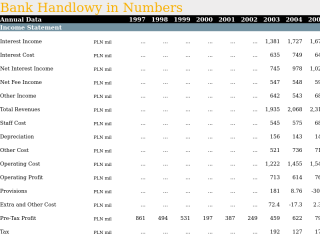 Historically, the bank’s net profit reached an all time high of PLN 3,807 mil in 2011 and an all time low of PLN 887 mil in 2001. The average profit in the last five years amounted to PLN 3,139 mil. The bank generated an average return on equity of 11.9% for its shareholders in the last five years with a maximum of 15.8% and a minimum of 9.02%. Comparing PKO BP with its closest peers, Pekao SA generated a net profit of PLN 2,279 mil with a ROE of 9.84% in 2016, Bank Zachodni WBK netted PLN 2,167 mil (ROE of 10.4%) and ING Bank Slaski announced a net profit of PLN 1,253 mil giving a ROE of 11.8%. The net profit of the Poland’s banking sector amounted to PLN 73,525 mil in 2016, up 10.8% compared to the previous year. Heading up the rankings, PKO BP accounted for 3.91% of the sector’s net profit in 2016. The top 3 companies held a 9.96% share while the five largest firms some 13.3% in 2016. You can see all the banks net profit data on the Net Profit indicator page or you can download a report on the Polish banks in the report section. What Banks in Poland Had the Most Branches in 2017? Based on a comparison of 15 banks in Poland in 2017, PKO BP had the most branches, followed by Alior Bank and Pekao SA. PKO BP operated a network of 1,192 branches at the end of 2017. That's compared to 1,233 branches some 10 years ago. Comparing PKO BP with its closest peers, Alior Bank operated a network of 905 branches in 2017, Pekao SA had 851 branches and Bank Zachodni WBK had a network of 735 branches in 2017. Polish banks operated a network of 1,863 branches in 2017. Total of 41,566 people worked for the banks in 2017. You can see all the banks branches data on the Branches indicator page or you can download a report on the Polish banks in the report section. What Banks in Poland Had the Most Employees in 2017? Based on a comparison of 15 banks in Poland in 2017, PKO BP had the most employees, followed by Pekao SA and Bank Zachodni WBK. PKO BP employed 28,443 persons in 2017, down 3.39% when compared to the previous year. Historically, the bank's workforce hit an all time high of 38,341 persons in 2001 and an all time low of 27,387 in 2013. Average cost reached CZK 8,713 per month per month per employee, 8.55% more than a year ago. This figure was CZK 6,221 per month some 10 years ago. Comparing PKO BP with its closest peers, Pekao SA had 17,339 employees with average cost of CZK 9,373 per month per person, Bank Zachodni WBK operated with 14,383 people (and CZK 9,054 per month per employee) and Alior Bank had 8,110 employees in 2017 with cost CZK 8,110 per month per head. Polish banking sector employed 41,566 people in 2017. You can see all the banks employees data on the Employees indicator page or you can download a report on the Polish banks in the report section.